Do you need a Winter GREATaway? Come January 2, the holiday season will officially be over. No matter where you live or how cold it can get there, the early months of the year tend to be gray and dark. 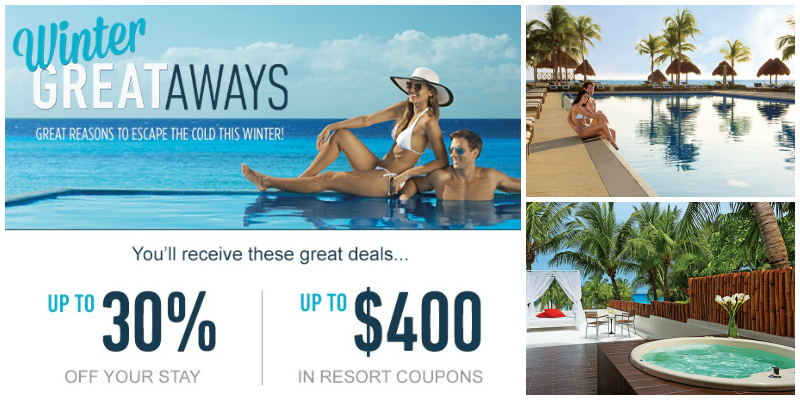 If you’re nodding your head in agreement, Dreams Resorts & Spas officially prescribes a Winter GREATaway! We prescribe a big dose of sun and sand to cure your winter blues! A Winter GREATaway is the best cure for a case of the winter blues. While you wait for summer to come where you live, a bit of paradise can be life changing. No to mention up to 30% of travel and up to $400 worth of resort coupons when you book before February 24, 2015 and travel between December 25, 2014 and April 10, 2015. After a good dose of tropical sun, a dose of the drink of the day and plenty of bed (or perhaps beach) rest you’ll be good as new. Check us out on Instagram for you first dose of paradise and start packing! This entry was posted in Dreams Huatulco, Dreams La Romana, Dreams Las Mareas, Dreams Palm Beach, Dreams Puerto Aventuras, Dreams Puerto Vallarta, Dreams Punta Cana, Dreams Resorts & Spas, Dreams Riviera Cancun, Dreams Sands Cancun, Dreams Sugar Bay St. Thomas, Dreams Tulum, Dreams Villamagna and tagged Dreams Resorts & Spas, winter greataways. Bookmark the permalink. ← Sip, Savor & See Your Way Through Vacation at Dreams!